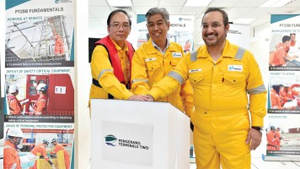 The first delivery of crude oil cargo arrives at Pengerang Deepwater Terminal 2 in Malaysia, marking the transition into the commissioning phase for startup at the mega-refinery project. A cargo of 2 million barrels of crude oil supplied by Petronas and Saudi Aramco will be used for commissioning and testing activities, which are scheduled tp commence in October. The construction of the refinery is nearing completion. Pengerang Refining and Petrochemical (PRefChem) on Monday achieved a significant milestone in the construction of its refinery at the Pengerang Integrated Complex (PIC) with the arrival of the first crude oil cargo at Pengerang Deepwater Terminal 2 (PDT2), marking its transition into commissioning phase for startup. With a refining capacity of 300,000 barrels of crude oil per day, the refinery — upon completion — will produce a range of refined petroleum products (including gasoline and diesel) that meet Euro 5 fuel specifications. Additionally, the refinery will provide feedstock for the integrated petrochemicals complex within the PIC, which has the capacity to produce 3.3 million tonnes per annum. The cargo of 2 million barrels of crude supplied by Petroliam Nasional Berhad (Petronas) and Saudi Aramco will be used for commissioning and testing activities, scheduled to commence in October. Currently, the construction of the refinery is nearing completion. The momentous occasion was graced by Abdulaziz M. Al-Judaimi, Saudi Aramco senior vice president of Downstream; Datuk Md Arif Mahmood, chairman of PRefChem, along with members of the PRefChem board of directors and representatives from Petronas and Saudi Aramco.